Anxiety & Depression – Counselling, Psychotherapy, EMDR & CBT Therapy (trauma + anxiety therapy). Clinical Supervision. Counselling, Psychotherapy, EMDR & CBT Therapy (trauma + anxiety therapy). Clinical Supervision. Counsellor/Psychotherapist, EMDR/CBT Therapist & competent Clinical Supervisor centrally located within easy reach of East, Croydon, South Croydon, West Croydon, South Norwood, & Beckenham. 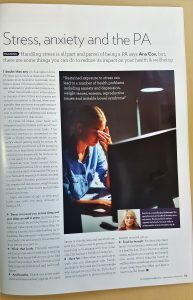 Whilst written with PA’s in mind this article contains handy hints for anyone suffering from stress, anxiety and related symptoms i.e. poor sleep.